Our first season as beekeepers has come to a close. We’ve had an amazing time watching both colonies grow in number, build wax comb, store pollen and nectar, make propolis and all the other bee things. We didn’t get to take honey for ourselves, but that’s ok. It is what I expected as each colony needs approximately 100 lbs of honey stored to survive a MN winter! We don’t walk away empty, though. Being with the bees has been breathtaking; a sort of other-world experience. Their massive number, highly ordered society, their reliance on each other, it’s a mind and ego-altering occasion to study the bees. For once, our perspective of ourselves is put into proper context – life is not all about us humans. There is so much that is so great, outside of our existence. Humbling. Refreshing. I’ll be the first to admit, though, that it has been a journey riddled with plenty of anxiety. We came to this with zero experience, but I didn’t anticipate this deep a level of uncertainty. The fuel behind my anxiety was the fact that the survival rate right now for honeybees is horrible. 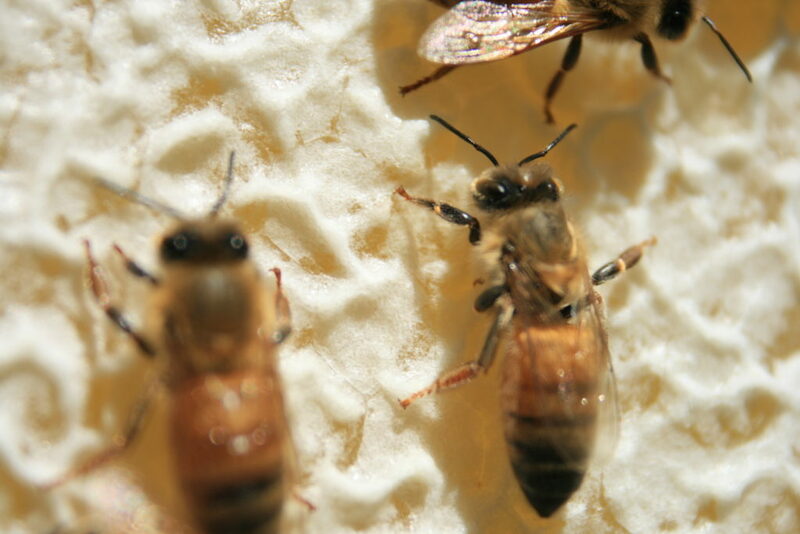 In one article, I read 50% of MN honeybees do not survive the year. The list of things that can go wrong in a honeybee hive is loooong. Of course as a newbie, it can be difficult to take all the proper measures to prevent incident, or to have a kean enough eye to notice issues. All season long, my mind swelled with soooo many questions and uncertainties. I’ve done my share of reading books and online resources, but there are some very divergent beekeeping approaches out there, so many different ways to do things. I think the best way to go about getting into beekeeping would be to have a mentor who is able to visit your hive, but that didn’t really pan out for me as attending evening beekeeping meetings to find said mentor is a challenge with bedtime for the littles. Beautiful bee stands atop a dollop of propolis. Look close to see a bee tongue! We also lacked confidence because our bees had a few setbacks. One, we installed them a whole month after most people in this area install. Two, they had to draw all new wax comb before they could store nectar and pollen, or the queen could lay eggs. 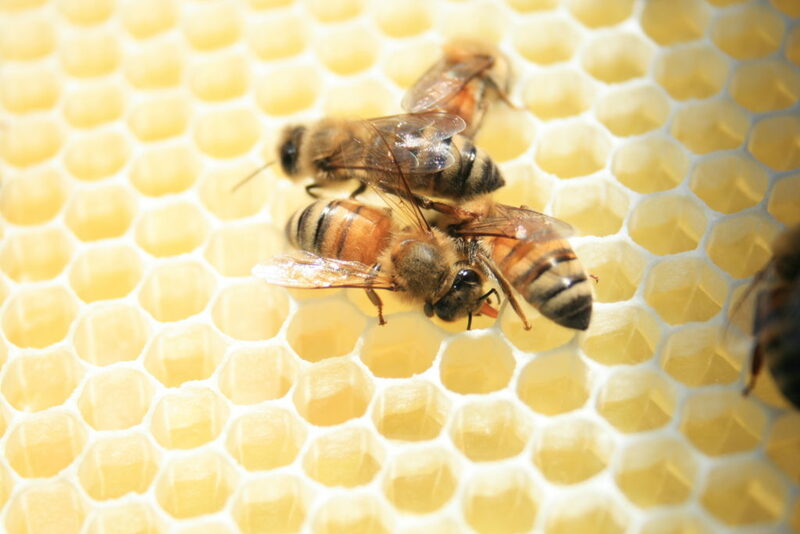 Typically, a beekeeper will have some frames of already drawn comb to give to their bees. Due to these things, they definitely missed a major MN nectar flow. 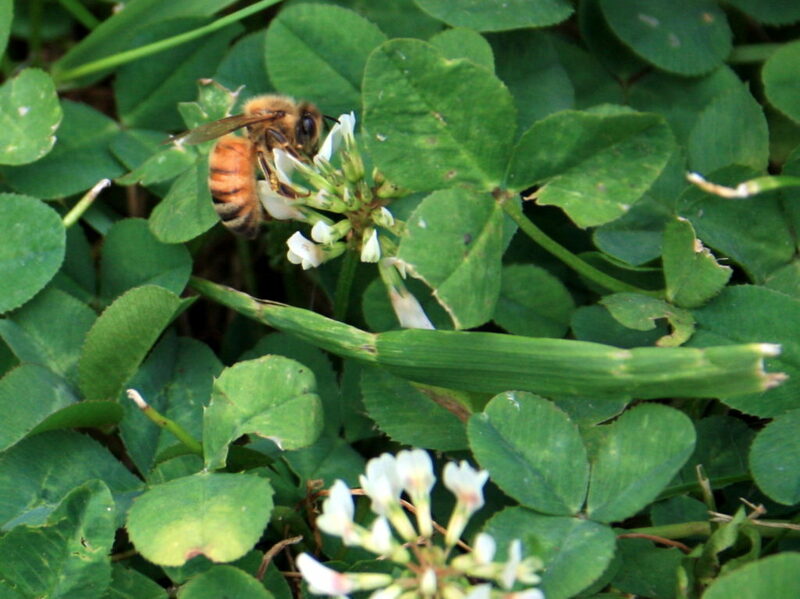 We are fortunate to have a yard full of clover flowers, or they may have been in even worse shape. During late August, things were looking really good, all things considered. The bees are tucked in for a long Minnesota winter. We followed all the recommendations, but we head into winter nervous as ever. 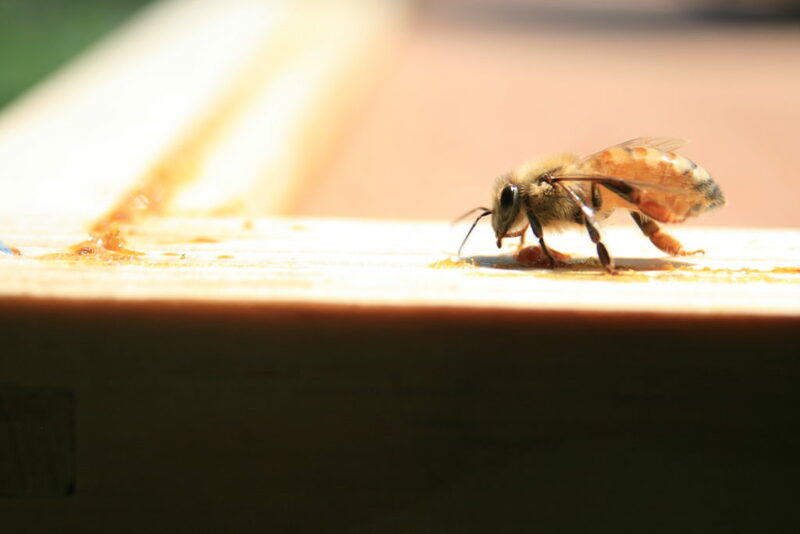 A recent check on the bees revealed that our strongest hive has significantly reduced honey stores. It’s unclear whether they were robbed (yes, even bees get robbed! 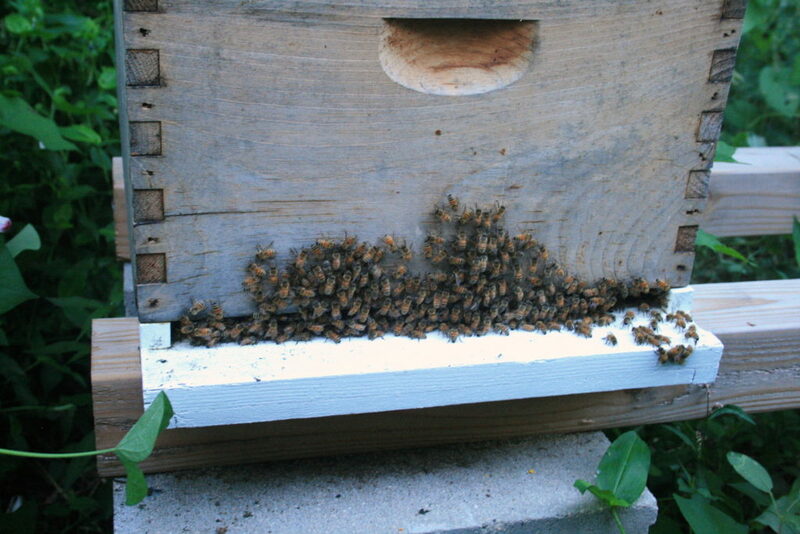 ), or perhaps some bees gorged on honey, then swarmed. There are fewer bees in there than before, but again, I don’t know what is normal. I know lots of drones get killed in anticipation of winter, and the queen bee stops laying new eggs somewhere in October or November, so some population reduction is normal, but how much, I’m not sure. This warm weather has given us the opportunity to feed them later than would normally be the case, thankfully, but it still seems they don’t have enough stores. Not a good feeling. This year has been one of major learning, a bit of experimentation, and lots of hoping! I definitely have a new appreciation for all our pollinators, and the price of honey. What is your source for quality honey? I love to hear about all the beekeepers out there! Thank you! It really is a rewarding venture! Oh, the beautiful, beautiful bees! I’m no beekeeper but my source for quality honey is Whole Foods Market. I buy locally harvested.